Gujarat government is using a mandatory Standard 10 and 12 online Board examinations form to single out and identify Muslim students, Ahmedabad Mirror today. 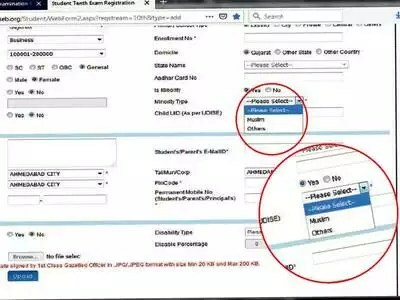 The online form, which all students appearing for the board examination have to fill, asks students if they belong to the minority category. Once the student identifies as a minority, the form has just two options, ‘Muslim’ or ‘Others’. This despite, the state being home to at least four other religious communities; Christians, Sikh, Buddhist and Jains. The Gujarat government, it appears, only wants to know if the student is Muslim or not. The state Board examinations are conducted by the Gujarat Secondary and Higher Secondary Education (GSHSEB). GSHSEB’s chairman, A J Shah, told the newspaper that the same form has been in place since 2013. Frantic parents are questioning why the Gujarat government is singling out Muslims and whether the data they are collecting could be misused, as it has been done in the past.